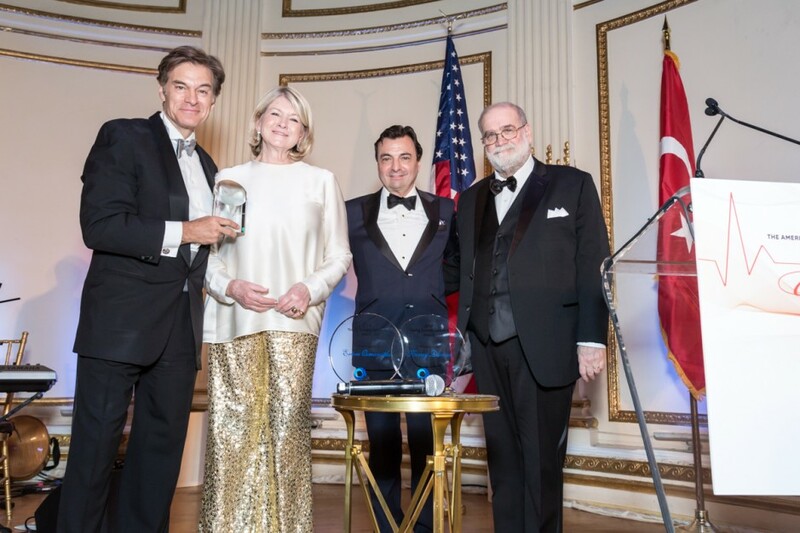 On May 2, 2018, The American Turkish Society held its Annual Gala celebrating the remarkable achievements of Dr. Mehmet Oz. The “Outstanding Achievement Award” was presented by Martha Stewart. Dr. Oz has won nine Daytime Emmy Awards for The Dr. Oz Show and is a professor of Surgery at Columbia University. He directs the Complementary Medicine Program at New York-Presbyterian Hospital and performs 50 heart operations annually. His research includes heart replacement surgery, minimally invasive surgery, alternative medicine, and health care policy. He has authored over 400 original publications, book chapters, and medical books, and has received numerous patents. He also hosts the internationally syndicated radio broadcast, Daily Dose. He writes a newspaper column syndicated by Hearst in 175 markets internationally and has a magazine, The Good Life, with Hearst, which was voted the hottest new publication in 2014. The Gala celebrated almost 70 years of The American Turkish Society’s work in enhancing US-Turkey relations and developing cross-cultural programming. At the event we welcomed guests from the public and private sectors, including diplomats, leading business executives, artists, scholars and thought leaders from Turkey and the United States. Proceeds from the evening directly benefit The American Turkish Society’s education, arts, culture, and business programs.